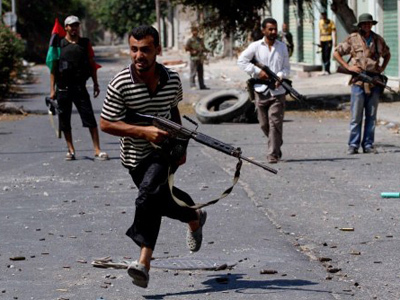 Independent journalist Lizzie Phelan who is in Tripoli says allowing the rebels inside the capital could well be a strategic move on the part of Libya troops who have corralled the rebels into a single location. She argues that loyalist forces remain in de facto control of the city. Most of the rebels who are not busy looting are now gathering on the Green Square in the center of Tripoli waving flags. 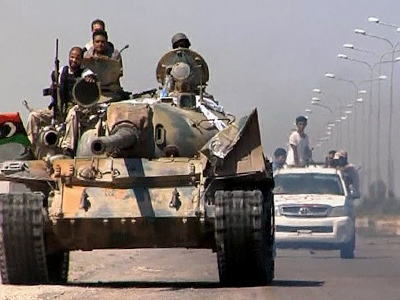 “What we have heard is that the strategy of the Libyan government and army was to permit the rebels into the city because previously they have been operating in a sneaky manner and it was very difficult to know who they were and where they were hiding, so that they could be dealt with in a direct manner,” the journalist says, adding that if this information proves true – it would be interesting to see what NATO undertakes to support the rebels on the ground. Meanwhile, there are reports that an assault on Muammar Gaddafi’s last stronghold – Bab al-Aziziyah compound – has started. The colonel’s whereabouts are unknown. 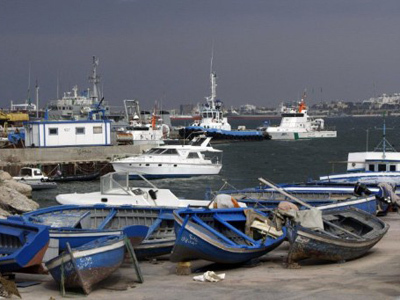 Reports say rebel forces are controlling most of the capital, Tripoli, with the exception of government residences in the city center. Journalist Mahdi Nazemroaya from the Center for Research on Globalisation is in Tripoli and has crossed live to RT, saying the situation is critical and the next several hours will be decisive. According to journalist, the rebel Transitional Council have ordered snipers to control the area around the hotel where foreign journalist are staying to ensure that no chaotic scenes develop in the vicinity. There is an electrified mob outside chanting clearly audible victory slogans and shooting in the air and the situation is increasingly tense. “There is no security, the only security is journalists securing the perimeter [of the hotel] by themselves,” Mahdi Nazemroaya said, adding that the rebels have been checking the documentation of guests at the hotel, which has been abandoned by staff, and have discovered that some of the journalists using the hotel are not journalists at all. Mahdi Nazemroaya says “Yugoslavian” tactics have been used, with NATO bombing out military and civil infrastructure to clear the way for the rebels. 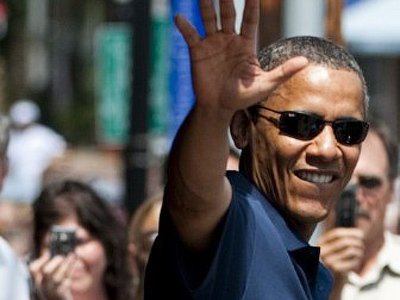 “NATO did all the work here with the bombing and their leaders must be held accountable as war criminals for killing civilians,” he said, questioning why NATO is engaged in toppling Muammar Gaddfi while regimes in Qatar and Bahrain have been suppressing democracy and killing their own people without being held accountable. Looters are already ripping off computers and screen projection units from the first floor of the hotel, going through rooms and grabbing whatever they can. The journalists in the deserted hotel are panicky, hanging signs saying “TV” and “PRESS” wherever they can, including on themselves. Journalists are hoping against hope that they will be evacuated from the hotel by international contingents from the UN, not NATO. Nazemroaya says crowds have gathered outside the hotel with the express aim of sowing panic and intimidating the press. 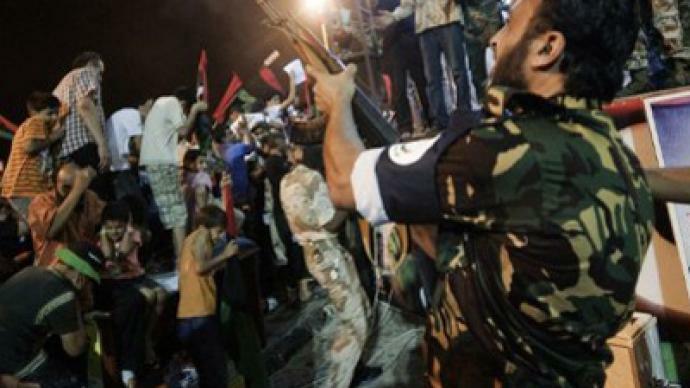 Libyan rebels claim they control most of Tripoli. Two of Gaddafi's sons have been arrested with some reports suggesting the leader himself is in a specialist cardiac unit in a town 14 kilometres east of the capital. . 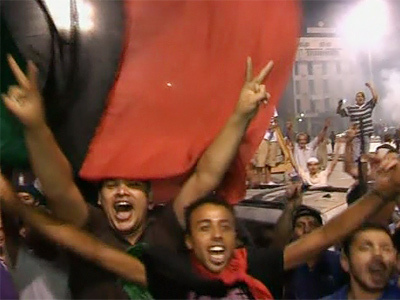 Following a night of chaos in the capital, crowds have gathered in the city's central square waving revolutionary flags.